The ID-e800 Reader is the most unique and reliable motorized terminal we have ever developed. Now used for 8 months in Police cars in TEXAS, the ID-e800 has proven the Hi quality and reliability of this reader. All Images are 600 bpi. And can be screened for MicroPrint or Hologram security features Live at the door! with the 400 times enlargement feature. No other device has the features to catch Fake ID’s, and store for legal defense the Images of VIP or Banned customers that can be screened at the Door. ID-e800 has a very small footprint with Magnetic strip or 1D & 2D capability in one package. 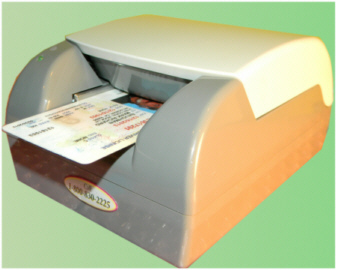 No other device gives the flexibility of low cost and high end data collection options for today’s POS environment. ID-e800 incorporates a new Optical system technology that gives a smooth bright image without glare, and surface reflection interference. Dark areas or daylight exposure from windows is not a problem. The ID-e800 Reader is the only dual function Age Verifier fit for Age Verification and Hi security features needed in Visitor Management environments. The 2D barcode reader is able to read wide linear and large 2D bar codes or the smallest micro PDF417 bar code labels found on today’s Driver License, giving un-match reliability. The ID-e800 ID scanner can save unlimited scans in memory . The ID-e800 unit can be easily customized to read even the most difficult or encrypted magnetic or 2D bar codes used for your business, institution or events. The ID-e800 is a fixed mounted terminal. With flexible programming can be used in Law Enforcement, POS, or institutional use making it one of the most cost effective terminal reader and imager available anywhere.